Yeah, I know: bad joke. Mine is still coming in from the garden and I don't know how many more baggies of shredded zucchini my freezer can hold. I still have one in there from last year, for cripes sake. But if you also happen to have a past-its-eating-prime banana hanging around, today is your lucky day. If not for the pathetic banana on the counter, I would likely have made my summer harvest zucchini bread this week. But frugality (read: cheapness) got the better of me: I was determined to use up the banana and the zucchini -- and not by throwing either one into the compost bin. My challenge to myself was to find a way to use them both in one recipe. Lucky for you, I scored. And scored big. You know how yummy banana bread is? And you know how much you love zucchini bread? Yeah? Well, now combine them together, add some flax seed meal to make it good for you and -- voila! 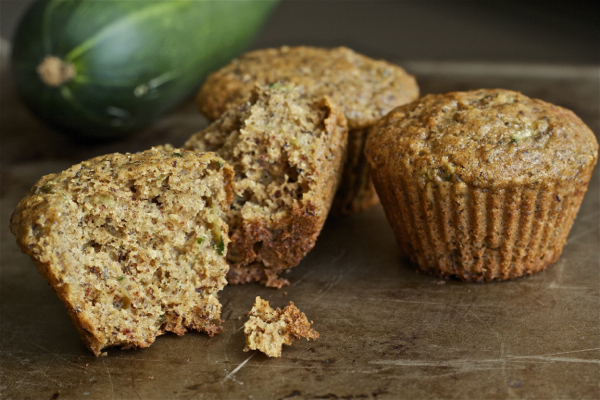 -- you've got The Ninj's favorite new breakfast: banana-zucchini muffins. The best thing about these banana-zucchini muffins is that they are incredibly moist, without any added oil -- and not that rubbery, oh-you-clearly-added-applesauce-instead-of-oil-to-make-it-healthy moistness. We enjoy them au naturel (which makes them handily portable), but they are also wicked with a little butter or fruit butter schmeared on them. Welcome back! Regular readers know that Monday is the day we share the CSA Share Ninja Rescue, a weekly feature in which you tell me on Fridays what veg you got in your CSA share box (or found at the farmers' market) that you don't know what to do with and I'll give you a whole bunch of recipe ideas on the following Monday. This week: corn! In my opinion, it's one of the things that makes summer so wonderful. And traditional corn-on-the-cob is always a tasty option, whether you boil it, grill it, slather it in butter or just eat it plain. But have you considered some other ways to prepare sweet summer corn? 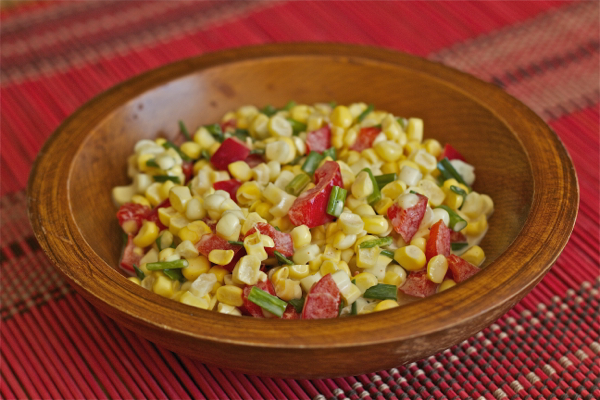 I discovered, after making a fresh corn salad (pictured) for the first time a few years ago that I actually prefer it raw in salads. You can just zip it right off the cob and it's ready to go (the OXO corn zipper will be your new best friend). Here are nine delicious ways to enjoy all that awesome summer corn -- and none of them involve the cob! Best-Evah Cornbread: Not lyin' -- it's the best! Enjoy with a bowl of chili. 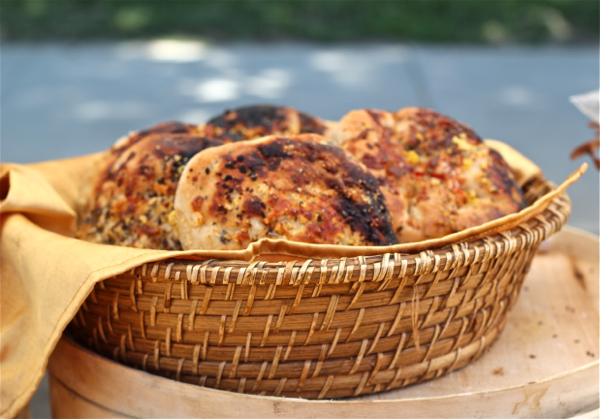 Bacon Cheddar Corn Muffins: How about slathering this savory muffin with some tomato jam? Sweet Corn Cocktail: Of course there's a boozy corn cocktail! What's your favorite way to eat corn? Leave a comment: The Ninj wants to know. Whether you’re a resident of or a visitor (or even a wannabe visitor) to my home state of Vermont, you’re probably well aware that the Burlington area is a food-lover’s paradise. Now there's even a food-focused walking tour of Burlington. Burlington Food Tours offers a cultural walking tour of the downtown area, with tasty sampling stops along the way at various vendors at the farmer’s market as well as specialty food shops and area restaurants. 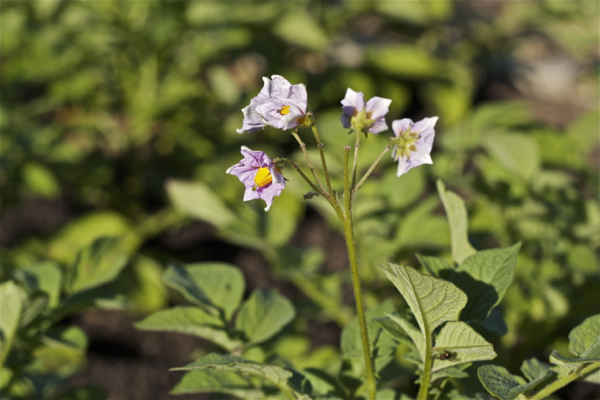 The experienced guides also provide some Burlington food history and overview of the area farming and locavore culture along the way. I recently took part in this food-focused walking tour. You can read about my experience in this piece I wrote for Vermont Life magazine's web site. It is indeed Monday, the day we share the CSA Share Ninja Rescue, a weekly feature in which you tell me on Fridays what veg you got in your CSA share box (or found at the farmers' market) that you don't know what to do with and I'll give you a whole bunch of recipe ideas on the following Monday. But the feature may look a little different today. I decided to shake things up a little and not focus on specific vegetables but on a technique instead. So today we're talking preserving: namely, preserving through pickling. Pickling is a great way to preserve a lot of the garden's excess bounty to enjoy over the winter months, when your CSA or garden isn't overloading you with delicious, colorful veggies. Additionally, I tried to include a lot of recipes and posts from some of my favorite bloggers, rather than just recipes from professional chefs and foodie mags (although they are represented as well). Who knows? You might find a new blog to follow! Let's get pickling, shall we? 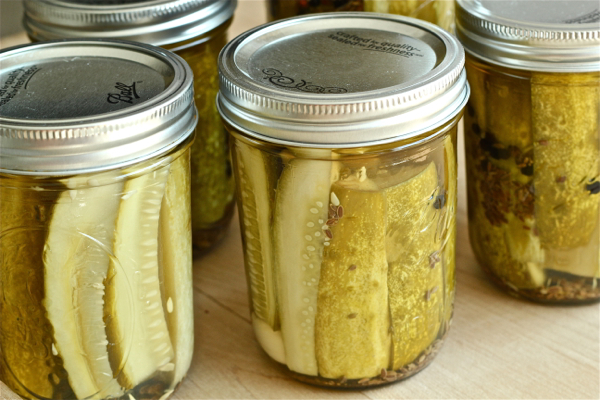 Do you have a favorite pickling method or recipe? Leave a comment below: The Ninj wants to know. More excitement around Casa de Ninj this summer: the high-bush blueberries are producing! Regular readers will recall that last year was pretty much a crapfest in the wee orchard: no peaches, no pears, no cherries, a handful of blueberries and a few measly apples. Pffft. Hardly worth the countless hours I spent hand-picking beetles off all the trees. Of course, all this misery was courtesy of Mother Nature, who is a fickle broad indeed, giving us a killing late spring frost in 2012 -- as if we hadn't gone through enough cold all winter. Similarly, this summer she has given us unseasonably cold temperatures alternating with blistering heat and seemingly endless rain. For cripes' sake, it's mid-August and I'm still waiting on the tomato harvest; if we don't scoot this along, my unripe tomatoes will be touched with frost before I can eat them. But it turns out there's a silver lining to all this craptacular weather: the blueberries are thriving. I'm done complaining. We only have four blueberry bushes and I have already harvested at least six quarts, with many more out there just waiting for me. We have oodles, even with my sharing them with the birds this year (we're all peacefully co-existing now that I've started feeding them and gave them some bitchin' bird baths). So I was delighted when the week's "assignment" from Sherri Brooks Vinton's Put 'Em Up Fruit for the From Scratch Club's virtual book club turned out to include blueberries. I already put up some of what I'm calling Black and Blue Jam this year, using the aforementioned blueberries and a boatload of wild black raspberries foraged from the edges of our woods, so I wanted to try something other than jam. 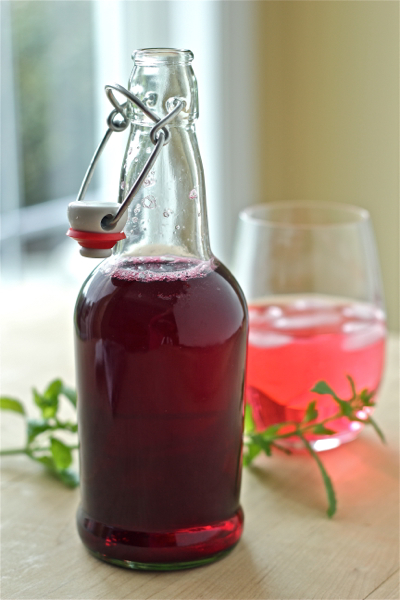 Behold: Sherri's book offered up blueberry vinegar! Happy Monday, friends! Why so happy? Because Monday is the day we share the CSA Share Ninja Rescue, a weekly feature in which you tell me on Fridays what veg you got in your CSA share box (or found at the farmers' market) that you don't know what to do with and I'll give you a whole bunch of recipe ideas on the following Monday. Coming up in gardens this week are lots of colorful, yummy carrots. I was a little boring this year and planted small orange carrots; if they survive the swarm of bunnies in my yard, next year I might try some purple heirloom varieties. They'd look so lovely in salads and slaws. 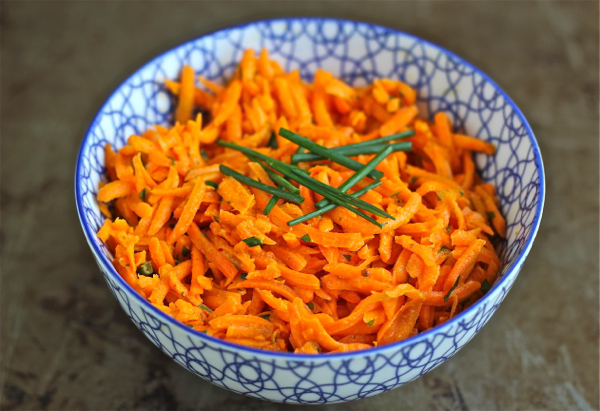 Speaking of which, the French carrot slaw featured in my photo is deeeeeelicious and included in this week's recipe roundup below. I love it because it's not the deli-counter mayo-laden, raisin-studded salad of my youth but instead a tangy, crisp side that really lets the flavors of the fresh carrots shine through. Dilly carrots: You love dilly beans, so why not quick-pickle some carrots? Do you have a favorite carrot recipe? Leave a comment; The Ninj wants to know. Not surprisingly, I've been asked to provide some suggestions for using up cucumbers. If you're a gardener, you know how sneaky these guys can be. One day there's a tiny little bud or two on the vine and then -- BAM! 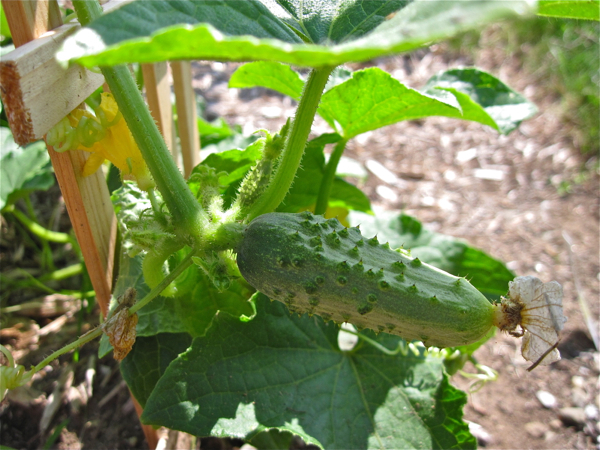 -- seemingly overnight you've got a garden full of cucumbers. I won't bore you this with a gajillion pickle recipes, either: we've pretty much covered that in other posts, so be sure to check out The Pickling Ninjipedia for all the pickling ideas you could ever want. Cucumber-mint ice cream: Come on, you know you've just gotta try this! 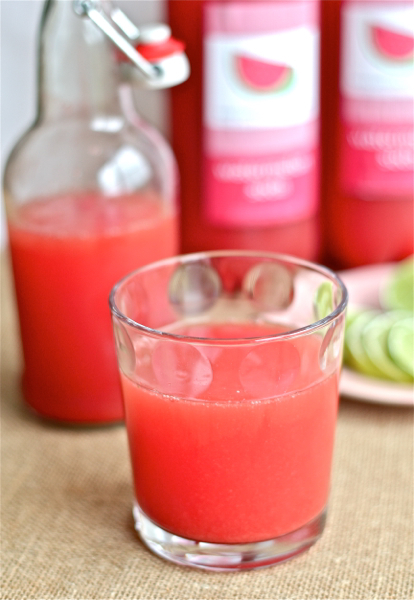 What's your favorite way to use cucumbers? The Ninj wants to know. 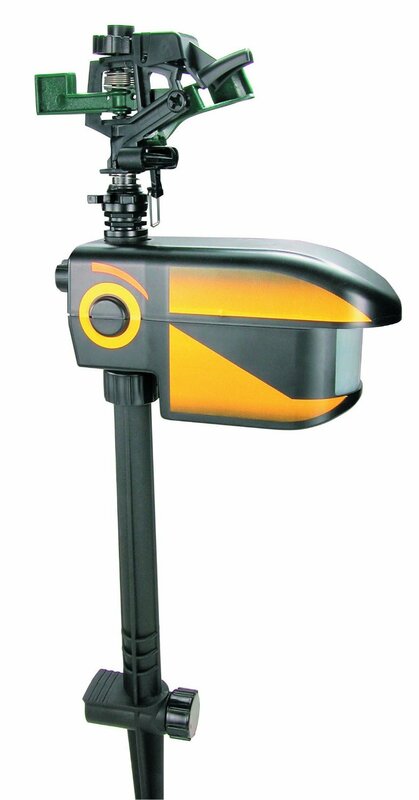 Thanks to everyone who entered last week's Nite Guard Solar garden protection giveaway. The lucky winner (picked by number generator via random.org) was Katherine C., who is hoping the units will help her in her fight against deer. Keep us posted, Katherine! I'm feeling rather fortunate (sort of) that I only have to contend with deer and bunnies, as well as the ocasional bear passing through. My readers apparently also have to deal with squirrels, chipmunks, cats, possums, raccoons and rats (UGH)! In addition to announcing the winner, I decided also to include a roundup of all the other critter prevention suggestions that came in via the comments, as well as some others I've heard bandied about. Have any of these methods worked for you? Or perhaps failed? Leave a comment: The Ninj wants to know.